Just over 12 hours ago the east coast of the South Island was hit by a major earthquake. In Wellington it rolled through shaking up everyone and everything. Thankfully we suffered no damage as the old house rocked and rolled with the punches. It was the strongest earthquake I’ve ever experienced and, being a born and bred Wellingtonian, I’ve been through a few. What I’m not used to are the aftershocks following this quake. They seem to have been constant for the last 12 hours. 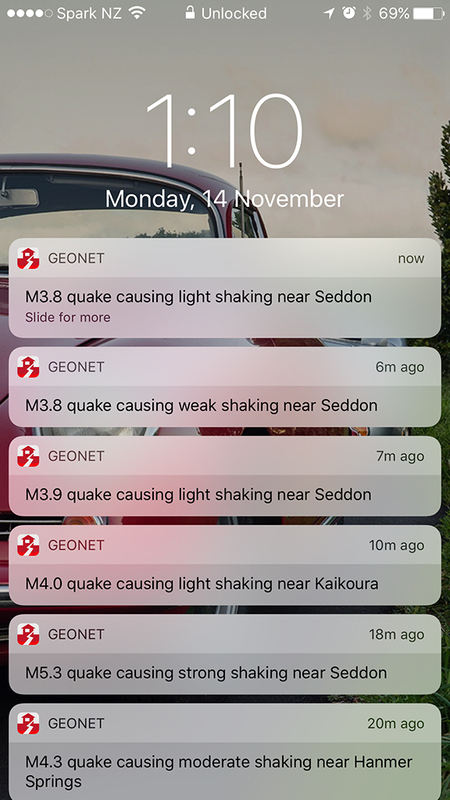 The shot below is my iPhone’s notification of “moderate” or greater earthquakes that have occurred in the last few minutes – about one quake every 4 minutes – with anything above 4.5 being strong enough to notice. The experts say this could continue for days or weeks.